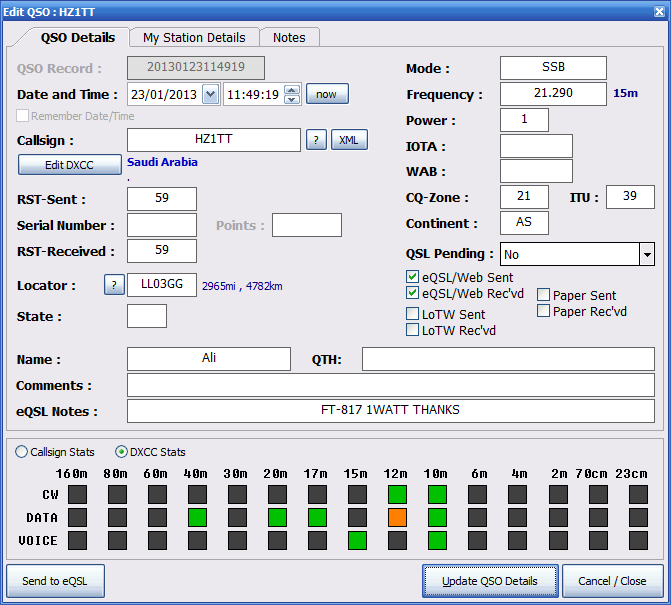 PZTLog came about because I wanted an easy-to-use logging application with simple/quick entry of various QSO fields plus some form of export of data so that I can display it on my website as text and GoogleMaps. This project evolved from an earlier attempt at a logging program called MiniLog which was abandoned after I lost interest in the hobby in late 2009. Fast-forward to the start of 2012… When I started operating again, I immediately found that several of the popular logging applications available didn’t suit my needs or my operating preferences. So – What Does It Do? It serves as a general-purpose logger (whether live or typing-up later) for ragchews as well as helping me keep track of contest QSOs on HF/VHF. Over the past few months, I have added additional features such as: PSK31 (and 63/125) + RTTY Datamodes, QRZ.com XML lookup, GoogleMaps KML output (eg: display QSOs in Google Earth), ADIF export, eQSL upload, DX Spot database with archive facility, CQ Voice Keyer, Contest “dupe-checking” and more. 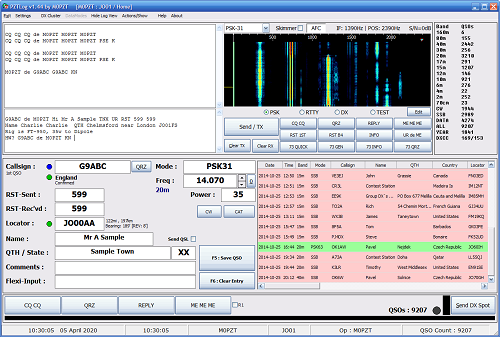 The software can run over a network, such as a multiband contest with a shared log and dupe/new-band alerts. 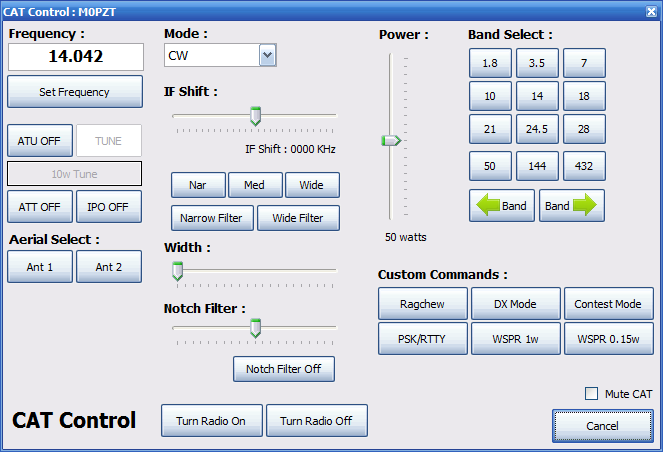 There are 2 “modes” that you can run PZTLog in: Full Mode offers a single-window with all of the log/cluster/datamode functions whilst Simple Mode offers a “windows” feature with a low-profile logger and optional Datamodes, DX Cluster and Log Viewer windows which can be moved/sized accordingly. 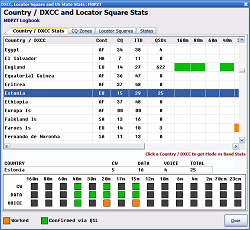 Flexi-Input of QSO Data – in almost any order you like! Enter Callsign, RST-Sent, RST-Received, QRA Locator, IOTA/WAB, CQ/ITU Zone and Comments/Multiplier in the same textbox and PZTLog will place it in the correct field for you – No more tabbing to find the relevant textbox! Here’s the simple process of logging a QSO using PZTLog. All of the above fields will be placed in the correct textboxes – You can save the QSO by pressing <enter> (with no text in the box) or by pressing the F5 key. 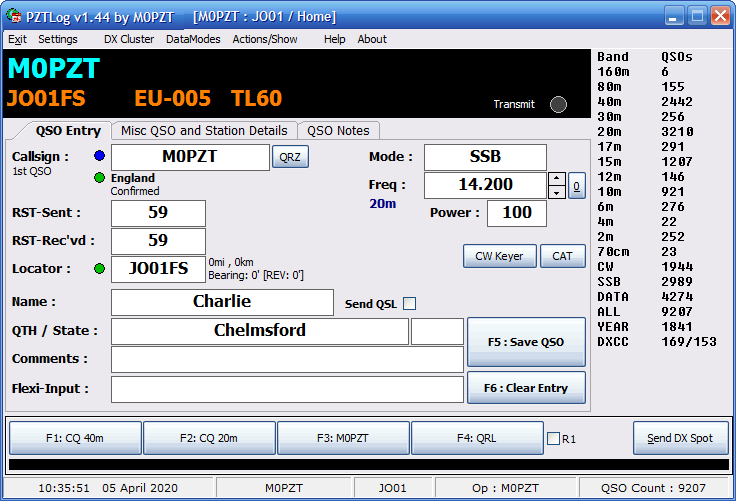 With a subscription to QRZ, you can look-up the Name, City, Locator Square, IOTA and State when entering a Callsign in either the Logbook Entry or QSO Edit windows. 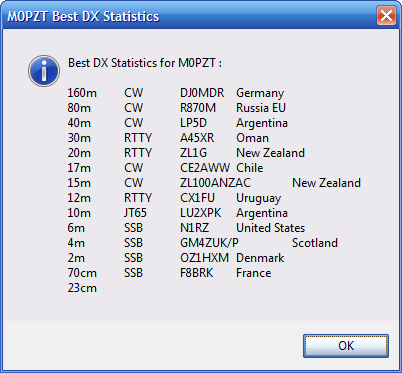 Keep an eye on the latest DX spots, and filter via the band/s you are interested in. 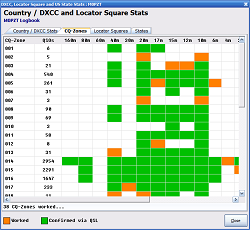 A DX Spot archive is now created within the DXSpots.mdb file – this is used to keep a list of previous DX Spots. A new DX Spot review window allows you to easily edit a DX Spot prior to “spotting”. You can tell PZTLog to only commit a QSO to the Logbook once a Locator and/or Serial Number has been entered. The current Serial Exchange is shown in large text for easy viewing. A “dupe” alert is also shown if configured. There is no system in place for calculating points or exporting to Cabrillo at this time. Easily check which bands/modes you’ve worked a particular station on – You can also select from the list of Countries to see at a glance how your band vs mode stats look. Displays the QSOs in the log for easy look-up as well as “have we worked before”, new band/mode slot and new locator square etc. When a callsign is entered in Full Mode, PZTLog will revert the Log display to show all previous QSOs with that station – and, in the case of Contest operating, will alert you to a “dupe”. 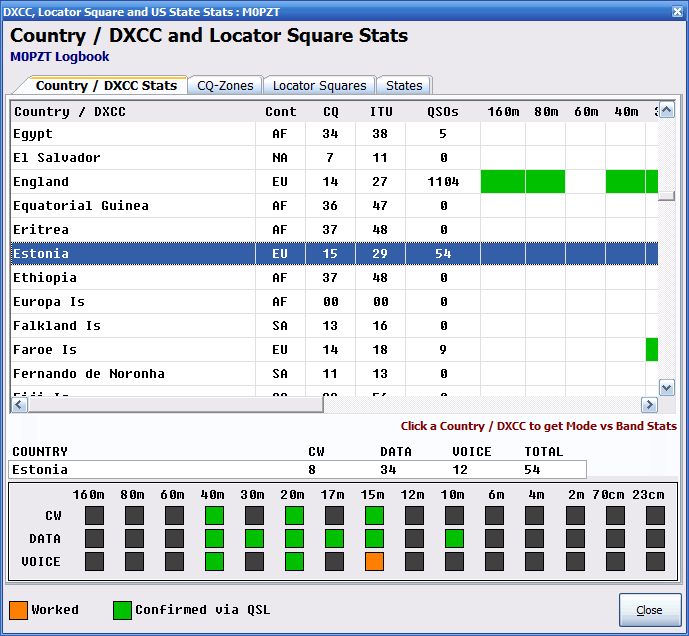 It also shows you DXCC data so if you hear a callsign and can’t remember the Country it belongs to, just type 3 (or more) characters and PZTLog will tell you. When using QRA Locators, PZTLog will give you distance (in miles+kilometres) plus bearing for the target locator square – For QSOs that have a QRA Locator Square logged, you can filter via band (or other search result) to find the “Best DX” – here’s mine. Play up to 4 MP3/WAV file CQ messages with PTT keying via COM port – this requires an opto-isolator for PTT switching, eg: a “soundcard” interface as used with AGW/PSK31/WSPR etc. A new CW Keyer using the CWType API can be used to send CW – great for quick CW QSOs. Basic Macros for CW are supported. Each QSO, when saved, can be automatically uploaded to eQSL either from PZTLog or via PZTFTP as part of the usual logbook FTP upload process. You can also manually upload to eQSL with a single click via the Edit QSO window. You can export your Logbook Database to a ADIF/eQSL, CSV or simple Tabbed Text File. You can also export to GoogleMaps KML for plotting of worked stations on a map (uploaded to your webspace via PZTFTP). There is also a basic ADIF import routine so you can easily upload the exported ADIF file to ClubLog/eQSL etc. 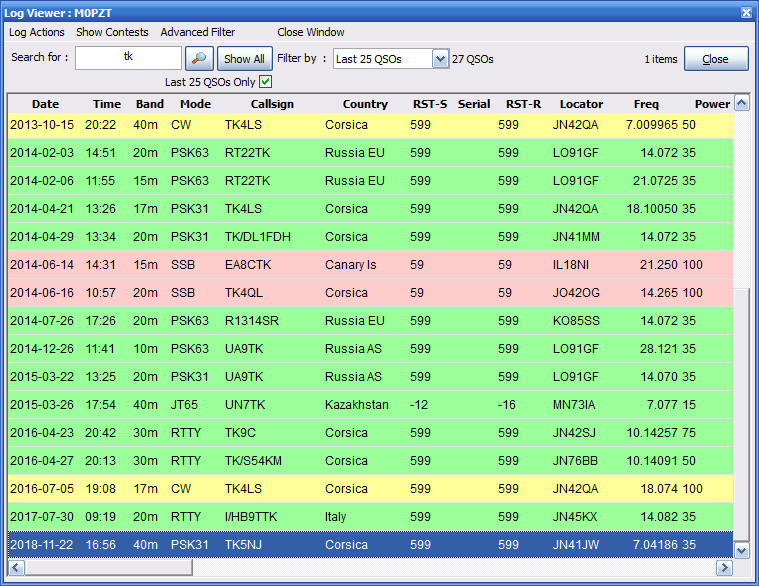 You can display the CSV file from the JT65-HF software and easily add QSOs to PZTLog but double-clicking the exchanges. 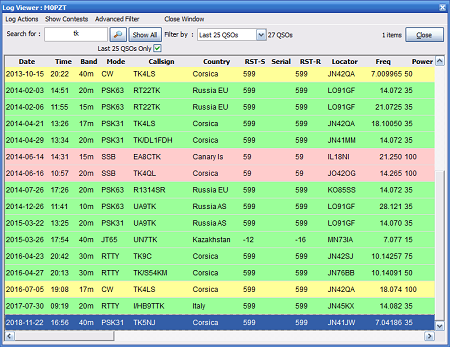 The HB9HQX build of JT65-HF is also supported but not the most recent versions as he’s stopped CSV file logging (boo!). Despite the variety of features, PZTLog is easy-to-use and great for Club-events as an alternative to paper logging. The Flexi-Input allows for rapid-entry of QSO details so great for single-op working or even the non-computer-literate! You are given Logbook Entry, LogView, DX Cluster and Datamodes in a single window. A separate Log Viewer window is also available. This caters for most requirements, screen resolutions as well as operating preferences. Note: This software is no longer actively developed as it’s reached it’s limit in terms of features vs size vs layout – I’ve put about as much into the software as practically possible and have since moved onto other projects. As I operate /P a fair bit during the warmer months and dislike using a paper logbook – I wrote a very simple logging application for the Android OS called tabLog. It outputs an ADIF file so can easily import into PZTLog, Ham Radio Deluxe etc. This software is free to use and offered here on the basis that you may find it useful – I don’t provide any support for it. It was designed as a logging program purely for my own needs and operating methods. Please note that this is a Windows application and I work exclusively in Microsoft Windows – If you’re running Linux or a Mac, I can’t help you. The software works best when installed to C:\PZTLog. Some of my programs have their main EXE file compressed which can cause some enthusiastic virus scanners to complain. This is the full-installer for first-time users – Simply run the installer (as Administrator) and enjoy. Existing users can just use the Update Zip (below) and put the latest files into their program folder. You can also run this installer over the top of an existing install without loss of any data/settings.